The Indy is back in force. 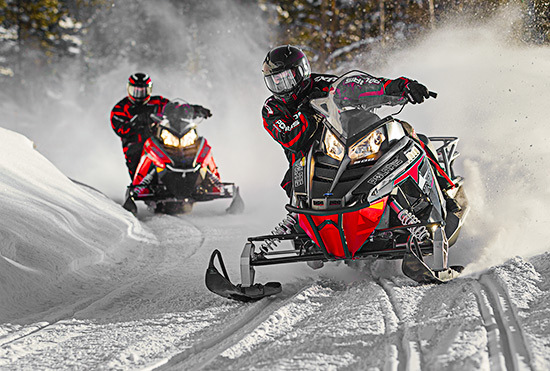 For 2014 Polaris now adorns ten snowmobiles with the Indy name. The engines include the 800, 600 and 550 fan. Top of the line is the Indy SP 800 and Indy SP 600 with Cleanfire engines. Both have the Pro-Ride chassis and seat, along with with a coupled rear suspension and a 121 inch track. The standard 2014 Indy 600 has all those items and a $7,999 sticker price. Take that! The biggest difference between the standard Indy and the SP are the shocks. The 2014 Indy is supported by RydeFX MPV shocks while the Indy SP’s wear Fox IFP. The 550 Indy has all the Indy goodness propelled by a 121 Shockwave track on top of gas shocks. Several 550 models are available on 144 tracks with coil-over rear suspension. They feature a new CVTech Powerbloc clutch that are lighter and quiet. Two-up touring entry is anchored by the LXT. The Adventure has the two-up Lock and Ride Convertible Seat and carries all the bells and whistles. Both have gas shocks. The Voyager has a utility sled flavor, rack and all. Available with the 600 liquid and 550 fan, they feature RydeFX shocks wrapped in a 144 inch track. The RUSH line is down to two models, the 800 and 600 Pro-R. Carrying over from last year with some minor updates, they feature big bump progressive rate rear suspension performance and Walker Evens shocks. The Switchback models are long track versions of the RUSH with some shock choices. Polaris SnowCheck models will offer color choices on tunes and panels, windshields, and accessories.